Coils were stored on trains in front of the ThyssenKrupp steel mill in Duisburg, Germany. WHEN AMERICANS AWOKE on March 1, our sustained economic recovery was humming along. All we required was that our president keep his hands off the wheel. No such luck. 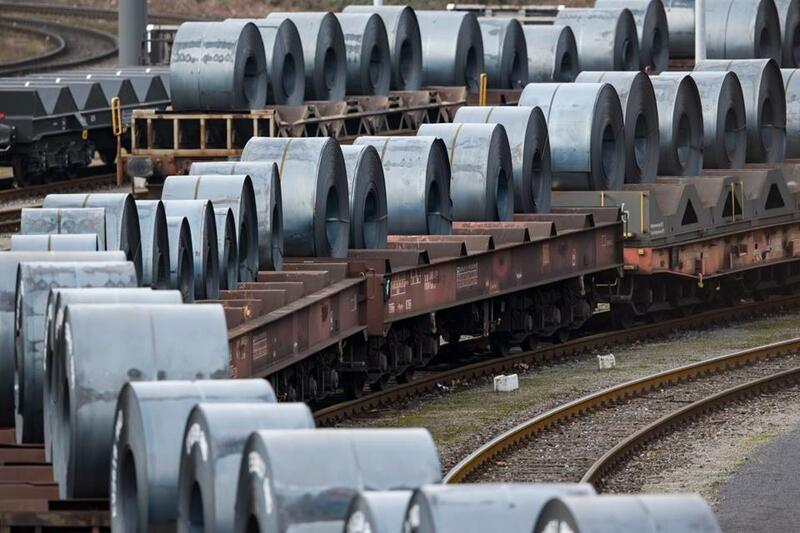 In a televised meeting with steel and industry executives, Trump precipitously announced steep new tariffs — 25 percent on imported steel, 10 percent on aluminum. Amid a worldwide shockwave, the Dow dropped 500 points. Little wonder. In style and substance, President Trump’s abrupt decision was unnerving. Prior to the meeting, sources indicated, an “unglued” president was seething with anger over the Russia investigation, Jared Kushner’s ongoing legal problems, and the departure of his key aide, Hope Hicks. The new tariff policy was not yet finalized or even written down; Treasury Secretary Robert Mnuchin and chief economic adviser Gary Cohen still believed that they could keep Trump from launching a trade war. Of course there is a case for targeted tariffs, judiciously crafted to dissuade particular countries from unfair trade practices. But Trump’s global tariffs are a blunderbuss — at once comprehensive and misdirected. The president responded to warnings from European leaders that his promised tariffs on aluminum and steel would trigger retaliation. First, their principal impact is not on Trump’s stock villain, China, but on allies like Canada, South Korea, Brazil, and Mexico. Geopolitically, this is feckless. We need allies to help us track terrorists and maintain global stability and, as shown by the North Korean nuclear threat, the cooperation of adversaries like China. Our deficit-ridden budget, aggravated by Trump, requires foreign lenders. Trade wars are never one-dimensional. But Trump also misapprehends basic global economics. Trade is not a zero-sum game: We import more than we export because we are the world’s wealthiest nation — and a net beneficiary of trade agreements that lower consumer prices while, the Chamber of Commerce estimates, generating 41 million American jobs. Trump displays an equal incomprehension of our domestic economy. American steel production is actually higher than 25 years ago; employment in our steel and aluminum industries, roughly 80,000, has plummeted chiefly because of technological innovation. By imposing tariffs to protect those jobs, he imposes higher costs on related industries — manufacturers of cars, cans, airplanes, wind turbines, drilling rigs, and military hardware — which employ about 6.5 million workers. Recent history offers a grim equation. In 2002 George W. Bush implemented steel tariffs. Within a year, 200,000 people employed downstream had lost their jobs, more than the total employees in the steel industry. The grateful steelworkers Trump imagines in the Rust Belt would be dwarfed by neighbors without jobs. Coupled with higher prices on consumers, Trump’s tariffs could seriously damage our economy. Even more disturbing is Trump’s clueless declaration that trade wars are “good” and “easy to win.” Already, our global trading partners — like the EU, Canada, China, Japan, Brazil, South Korea, and Australia — are threatening retaliation against American products, from bourbon to jeans to motorcycles. Far from sobered, Trump responded by threatening to impose tariffs on imported cars, then invoking his tariffs as pressure on Canada and Mexico to renegotiate NAFTA. An escalating trade war could swiftly become seismic. Take Trump’s threat to make foreign cars prohibitively expensive. Our domestic car industry depends on steel and aluminum from Canada, as well as engines, electronics, and wiring manufactured abroad. To produce cars made wholly in America would require plants to close or repurpose, workers to relocate or retrain — or lose their jobs — and companies to suffer enormous losses as the value of their stock crashed, spreading further damage throughout the economy. Or take American farmers — historically the first casualty of trade wars. In 2016, farmers exported $14.2 billion of soybeans to China in 2016, nine times more than the next largest market. Only Trump could expect China to forbear, or forget that it holds trillions of dollars in US debt. But only Trump would also ignore what sober economists most fear — that an all-out trade war would trigger a global recession, cratering GDP and markets worldwide while eradicating an estimated four million American jobs. Would Trump risk all that? No sane president would. But one worries whenever this less-than-stable president is home alone.